As you can tell from the historical background, this is an Opel Blitz. Like many model companies, in order to avoid paying fees, often just generic titles are used. This may seem a bit underhanded to some, but we all benefit by not having a higher priced kit because of it. 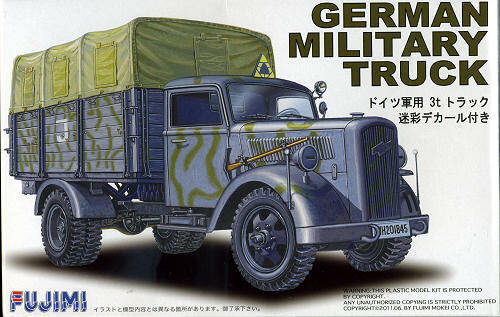 I am just guessing, but it may be that this is 1/76 instead of 1/72 scale as many of Fujimi's military kits fall into that scale. Since the scales are so close, they are often marketed as 1/72. Regardless, the molding on this one is very well done with only a touch of flash here or there. I saw no sunken areas nor any issues with mold mis-match. I did, however, find a raft of ejector pin marks on all of the bed interior or underside pieces as well as on the inside of the top. This means that if building the kit without the canvas top piece, quite a bit of work will be needed to remove these marks. 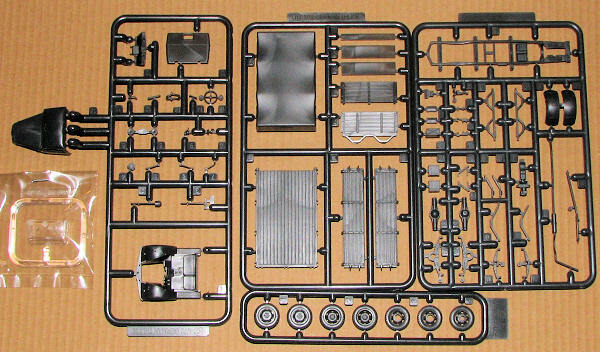 The sprues are all molded in a very dark grey with a single clear sprue that covers all the cab's windows in one piece. The cab interior is well detailed for this scale with not only the steering wheel, but all the other selector levers as separate pieces. A one-piece chassis is provided onto which the leaf springs, exhaust, and the axle assemblies are installed. There is also an engine lower section to be added as well. Metal axles are provided for the well molded wheel assemblies. One of the large sprues contains all the parts for the rear bed. There is a floor section as well as four separate side walls to install. Slats for seats are also included. The interior can be hidden from view by a one-piece canvas top section. Instructions are well drawn and provide Gunze paint references. The instructions are completely in Japanese, but it should be no issue to figure out what goes where. Markings are provided for one option that is shown on the box art. 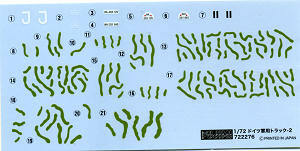 The decal sheet includes all of the camouflage that you see as well as license and unit markings. As the unit info is in Japanese, I can only guess but the vehicle is pretty much overall panzer grey. Overall, a very nice small scale military vehicle that does not seem to be as fiddly as other Blitz models in this scale. Should look great by itself or in a diorama.